October 2018 www.coalage.com 19 u.s. prep plant census 2018 continued lar Grove mine, with first coal expected to be produced in late fourth quarter 2018. The Poplar Grove prep plant, which would be America's newest prep plant, is currently in the final stages of the commis- sioning process. The 400-tph two-stage, heavy-media plant is expected to process 3.6 million tpy of raw coal with a 76.1% recovery and provide an 11,200-Btu/lb product. Stella Natural Resources, a Canadian company, recently entered the Appalachian region with a methodical strategy to devel- op a sustainable business, explained Stella's CEO David Stone. The company acquired and refurbished the Ivel plant, which is now operating at nameplate capacity. They restored operations at the Lockwood Dock and they are currently recommissioning two underground properties. The Ivel facility now produces a pul- verized coal injection (PCI) product and typically three different types of industrial specialty coal ranging from a 2% ash mini stoker to a 7% ash lump stoker. "We can now also easily change the decks and set- tings to meet our customers exact require- ments," Stone said. Stella recently loaded its first unit train of specialty stoker product from the Ivel facility. "We have been washing and cre- ating numerous products for our custom- ers' specifications over the preceding year, though all of it was transported to our cus- tomers though our dock facility on the Big Sandy River," Stone said. "This first train demonstrates Stella's regional capacity, with this product bound for Canada." Deserado Upgarde At the 2018 CoalProTec conference and exhi- bition, Surendra Jain, president, The Daniels Co., and Bill Lepro, the surface superinten- dent for Blue Mountain Energy, gave a pre- sentation on the recent Deserado prep plant upgrade. Located near Rangley, Colorado, Blue Mountain Energy's Deserado operation is a captive longwall mining complex that supplies coal to the Deseret power plant. The Deserado prep plant was built in 1983 by McNally Systems. It was equipped with a jig and water-only cyclones and engineered for a raw feed capacity of 500 tph. Over time, the quality of the raw coal changed and modifications were made, but the plant only operated at about 325 tph. With the Deseret power station facing environmental pressures, Blue Mountain Energy began to look at ways to improve the quality of the fuel they were delivering to the power plant, which would extend the life of the power plant and the mine. They ap- proached The Daniels Co. in summer 2016. After evaluating the clean coal at the time, Jain said he knew they could im- prove the product and increase the plant's raw feed capacity to 800 tph. "It was ob- vious from the coal analysis that the ar- rangement was no longer suitable for the characteristic of the coal they were cur- rently mining," Jain said. The upgrade called for the jig to be re- placed with a heavy-media vessel and the water-only cyclones would be reconfig- ured to include heavy media, which would reduce the cut point to remove more ash. The expansion would also include a set of spirals to recover fine coal. The improvement with the heavy-me- dia vessel along with the combination of heavy media and water-only cyclones, would yield an additional 40 tph of 10,200 Btu/lb clean coal if the plant could process 800 tph of raw coal, Jain explained. Construction on the expansion began during summer 2017. 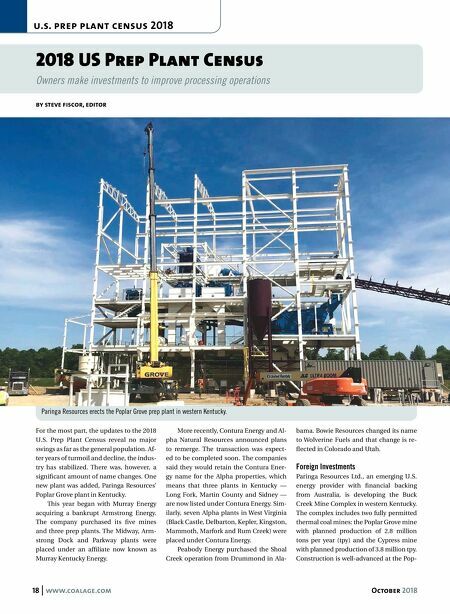 "This was a paral- lel construction process that allowed us to continue to operate while the installed sumps, screens, distribution boxes and the spirals," Lepro said. "On October 8, we shut the plant down, removed the jig, brought the new equipment in and began to rehabilitate the existing equipment." Exactly one month later, Blue Mountain started the heavy-media vessel and then the cyclones. The spirals began processing coal in January and project was completed early in the first quarter of 2018. "Today, the prep plant is providing cleaner coal to the power plant and for the first time in a long time, the longwall is working to keep up with the prep plant," Lepro said. 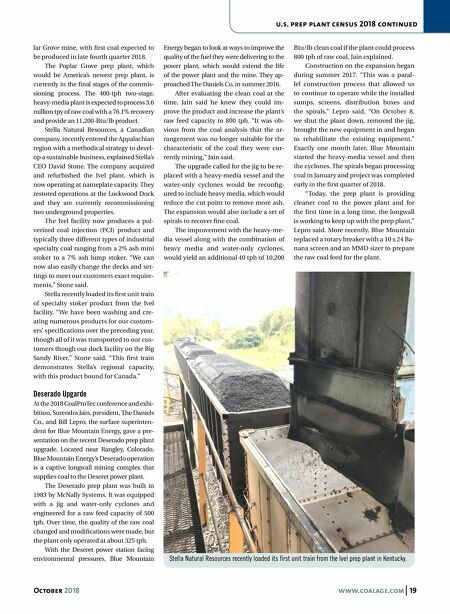 More recently, Blue Mountain replaced a rotary breaker with a 10 x 24 Ba- nana screen and an MMD sizer to prepare the raw coal feed for the plant. Stella Natural Resources recently loaded its first unit train from the Ivel prep plant in Kentucky.